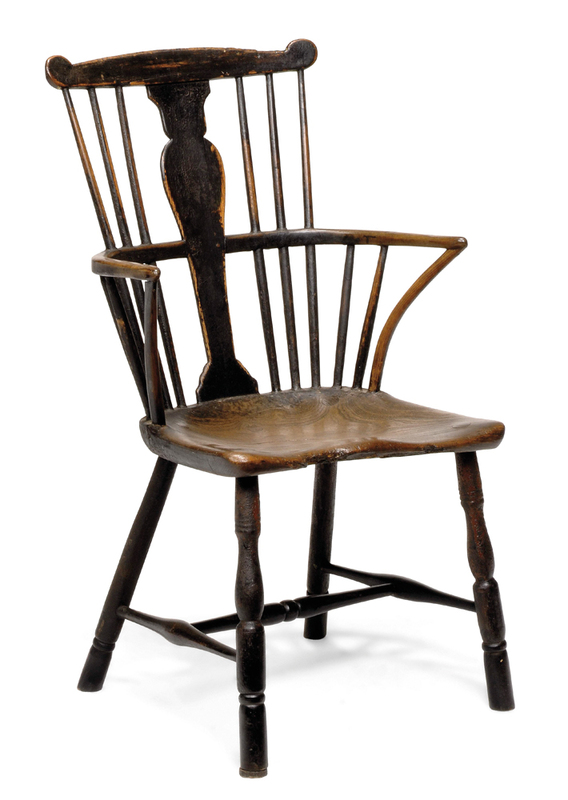 The Windsor chair is recognised as one of the classics of English country furniture. They were often made by village craftsmen to traditional designs in native woods like elm, ash, beech and yew. The form emerged in the early 18th century, though the origin of the name is obscure. 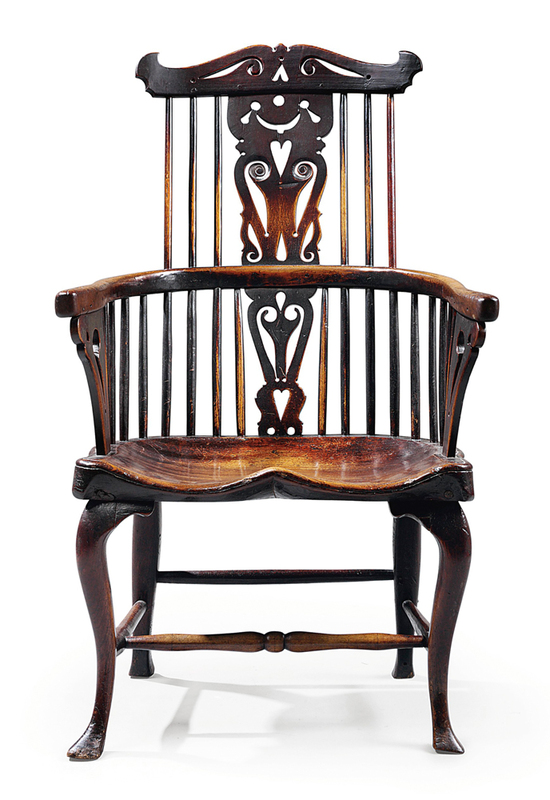 Chairs of this type were manufactured in large numbers in the Thames Valley in Buckinghamshire, and Windsor may have been a centre for distribution. In practice Windsor refers not to the place of origin but to a design principle where the legs and the back are both socketed into a solid seat and this form of construction proved so practical and popular that it was widely adopted not only by country craftsmen, but for mass production in factories for schools and other institutions. More sophisticated examples were also produced by fashionable makers for wealthy clients. Windsor chairs were made in a wide range of styles and there are distinct regional variations from all over Britain and the USA where the form was equally popular. Windsor chairs are still being made in the traditional way today. 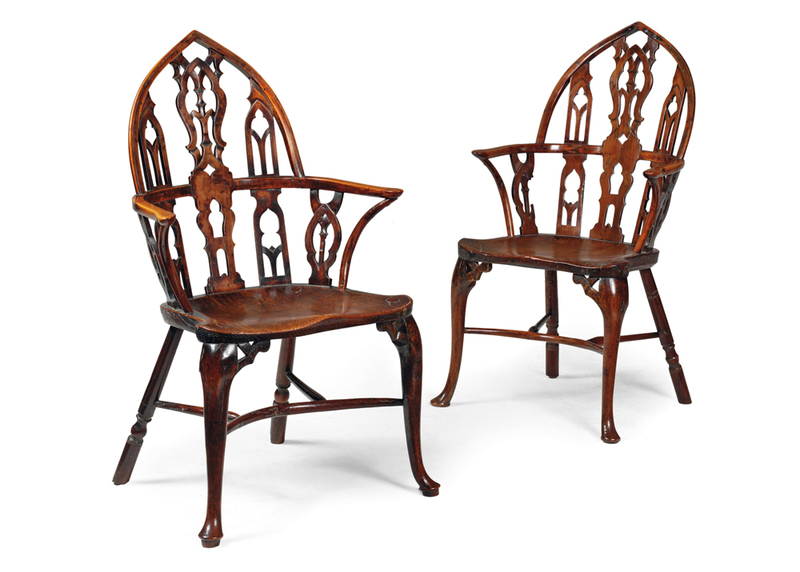 Two yew and elm Windsor armchairs which made £12,000 at Christie’s South Kensington in November 2009. A sophisticated near pair of Gothic design, they were made in the Thames Valley in the late 18th century. The enduring strength and popularity of the Windsor design is indicated by the fact that many are still in daily use 200 years after they were made. 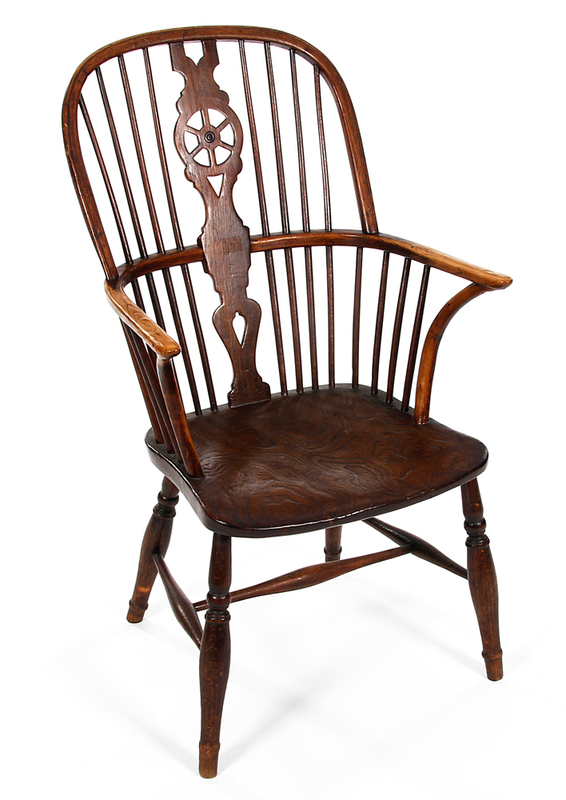 Most Windsor chairs are bought to furnish traditional homes rather than by collectors and they can represent excellent value for money, with examples of many of the most common types available for tens rather than hundreds of pounds. Connoisseurs look for chairs of unusual or refined design and for pieces in unaltered condition with original finish. 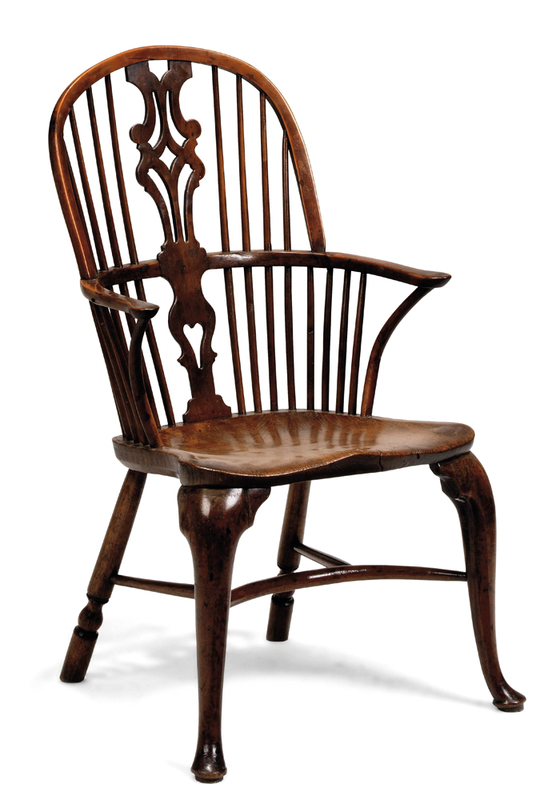 Windsor chairs were made in a large range of styles but the traditional English forms tend to be either comb- or hoop-backed with a central decorative splat. For comb-backed chairs, the upright spindles that form the backrest are socketed into a simple bar at the top. 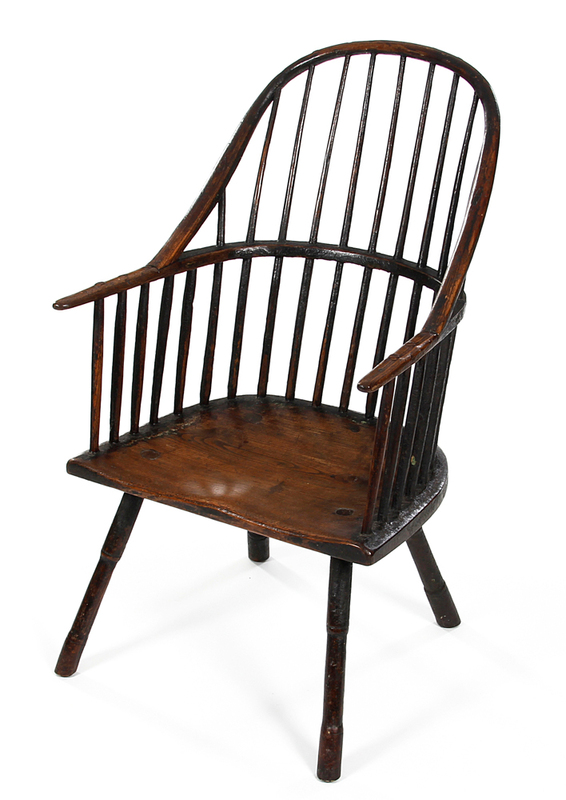 In hoop-back chairs the uprights are anchored by a bent arch of wood which is jointed into the seat or the arms. The arms are generally formed from a single length of wood bent into a bow. There will always be extra interest in unusual pieces such as Windsor settees, high chairs or rockers. Examples of the common types of Windsor chairs can often be bought for tens rather than hundreds of pounds. Simple slat-backed chairs were made in their thousands for institutional use and they continue to be excellent value for everyday seating today. Prices of £100 upwards can be expected for standard country chairs of comb- or hoop-backed form, with outstanding examples priced at £1000-plus, depending on form, colour and patination. At the top end of the scale there are chairs and sets of chairs that have sold for up to £10,000 or more. 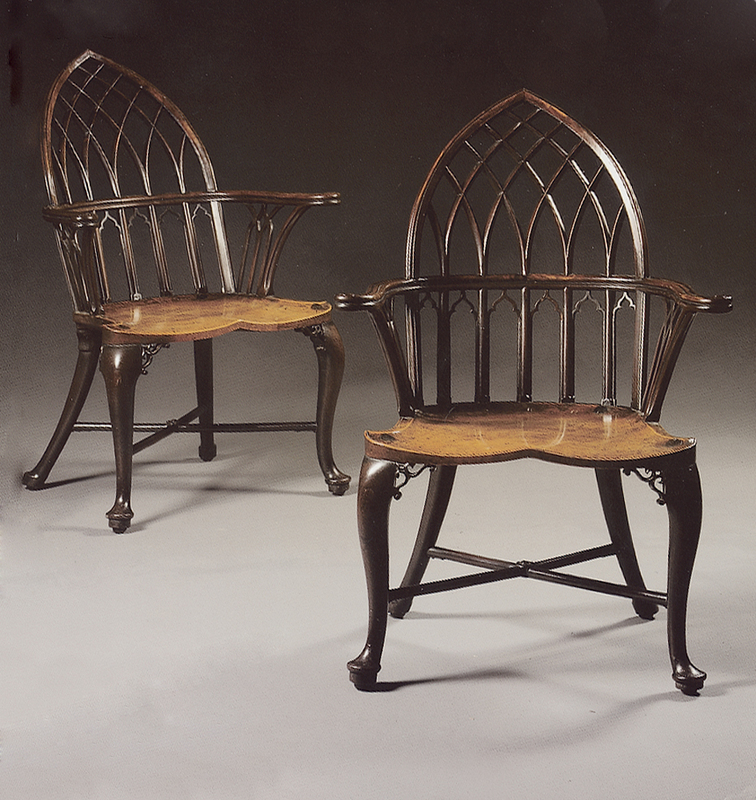 These are generally examples of more sophisticated design, such as the 'Strawberry Hill Gothick' chairs of the 1770-80s which have backs in the form of a pointed gothic arch, elegantly shaped seats and cabriole legs. These are generally reckoned to be among the most desirable of all Windsors. In general, the more sophisticated designs tend to command higher prices. The same goes for chairs with specific associations to a well-known house or owner. However, well preserved examples of early or primitive design that have not been altered or refinished will also be highly prized. Sets will tend to make more than the sum of the value of the individual chairs and, in the case of Windsor chairs, even sets where the chairs are not exactly matched can command a premium. Most chairs are unmarked so any stamped with a maker's name are of greater interest, especially if the name can be linked with a particular area. Many country chairs have acquired a particularly fine patina, having been polished through years of use and the elm seats can be spectacularly figured. Yew chairs are generally taken to be the most desirable. Some chairs were painted from the outset and in such cases the presence of the original painted finish is a plus point. Chairs that have been painted and later stripped are rarely pleasing to the eye. Watch out for chairs that have been damaged and recently repaired or with legs that have been shortened.